The Calcutta High Court on Wednesday upheld as constitutional and valid the Singur Land Rehabilitation and Development Act, 2011 by which the West Bengal government vested the land leased to Tata Motors Ltd (TML). Justice I P Mukerji, while upholding the validity of the Act, directed that compensation be paid to TML if it makes an application for it while noting that the district judge of Hooghly should determine the amount of compensation to be paid. Mamata Banerjee described it as a "historic verdict". "Today's verdict is historic verdict. Agitation of the farmers in Singur has not only shown the path to other parts of India, but also to the whole world," Banerjee said after the High Court verdict. "I am grateful to the court, I have the highest respect for the judiciary," she said. 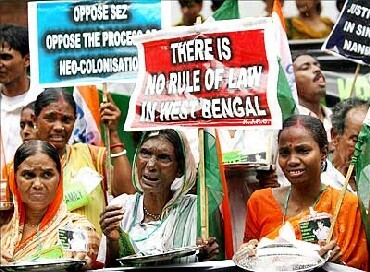 Banerjee said after the stay given by the court on operation of the order till November 2," she said. "We will decide on the modalities of giving back the land to the farmers." A large factory would be set up on 600 acres of land at Singur, while the rest 400 acres will be returned to the unwilling farmers who had not accepted compensation for the acquisition made by the erstwhile Left Front government in 2006, the Chief Minister said. In an apparent dig at the CPI(M) for slamming the Singur Land Rehabilitation and Development Act, 2011 passed in the Assembly, she said, "A lot had been said alleging we were in great hurry to push through the Bill and were committing mistakes." The court held that if TML, which had shifted its Nano car plant from Singur to Sanand in Gujarat alleging political unrest, makes the application for compensation, the district judge would have to dispose it within six months. Justice Mukerji stayed the application of the order till November two to give the parties a fair chance to appeal before a higher court, if aggrieved with the order. The court also appointed the district magistrate and SP of Hooghly district, within which Singur falls, as special officers to ensure smooth transfer of land from TML to the state in two months. The court also upheld the vesting of the land given to vendors, who had also challenged the Act in a separate application. Justice Mukerji disposed both the applications, by TML and the vendors, challenging the Singur Act which was notified on June 21. The government took possession of the Singur land totalling 997 acres on the evening of June 21 itself. TML had challenged the Act before the High Court on June 22, claiming that it was unconstitutional and as such vesting of the 600 acres of land leased to it was invalid. Around 300 acres had been earmarked for the vendors. 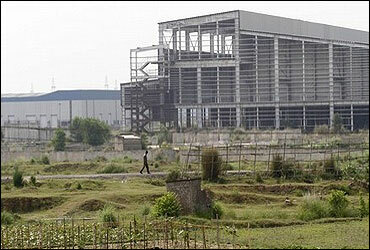 The West Bengal government had acquired 997 acres of land at Singur besides Durgapur Expressway, about 50 km from here, in 2006 for the Tata Nano factory. The Singur acquisition by the erstwhile Left Front government had led to a huge political unrest in the state over acquisition of fertile land, ripple effects of which were witnessed in other parts of the country as well. Political analysts say that the Singur acquisition was the first stumbling block faced by the then CPI(M)-led Left Front government that led to its debacle in the elections ranging from Panchayat to the Assembly. 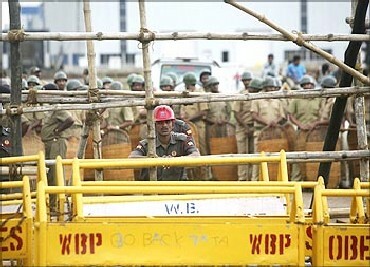 Image: Police at the site of Singur plant. 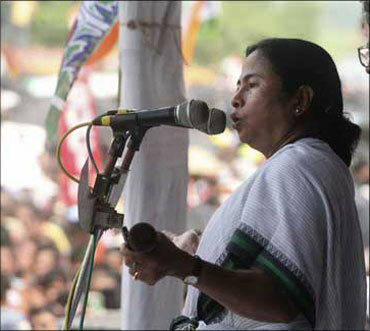 The Trinamool Congress, which had led the movement against acquisition of fertile land, won the Assembly elections by a landslide margin in May this year and the first legislation by it was the Singur Land Rehabilitation and Development Act, 2011 by which it vested the land leased to TML as also to the vendors. 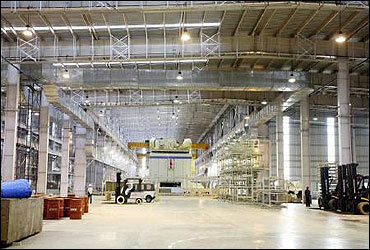 Image: The interior of the Tata Motors' plant in Singur. TML had moved its Nano plant from the state to Gujarat after it decided to shift the factory alleging political unrest and expressing apprehension for the safety of its workers and officials in October 2008. Though TML shifted all the machinery from Singur, it maintained the leasehold of the land. In reply to a letter by West Bengal Industrial Development Corporation (WBIDC) in September 2010, TML had expressed its willingness to hand over the land to it provided it was suitably compensated. 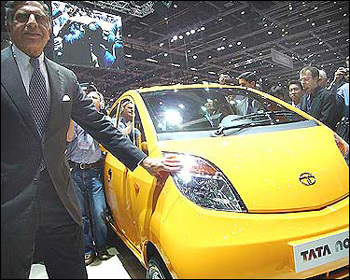 Image: Tata Group chairman Ratan Tata with Nano.